News and commentary from the Intellectual Property attorneys at Preti Flaherty. In the first two parts of this series (Part 1, Part 2), we examined what mediation is and considered reasons why a party might desire to engage in mediation. In our final segment, we discuss how parties may come to mediate a patent dispute and provide an overview of the mediation process. Parties can arrive at mediation in various ways. Some courts order parties to a patent litigation to participate in compulsory mediation. The old adage “you can lead a horse to water but you can’t make it drink” is applicable to court ordered mediations. While parties may be ordered to participate in mediation, they cannot be ordered to agree to terms of settlement. If the parties are not motivated to resolve the matter, they will only go through the motions. For this reason, court ordered mediations are less likely to be productive of a settlement than those to which parties voluntarily submit. Courts may inquire whether the parties desire to mediate. Some courts will refer the matter to federal magistrates or a private mediator if the parties are so inclined. Some contracts include a provision that requires a party to engage in mediation prior to the filing of a lawsuit. Parties to a dispute can privately agree to engage in mediation before or after the initiation of a lawsuit in an effort to find an acceptable resolution of the matter. Frequently, mediators will request that each party submit a written mediation statement that sets forth the party’s view of the case and the relief sought. The purpose of the written statement is to inform the mediator of the subject of the dispute and the posture of the matter. In preparation for mediation, parties should consider a number of questions that are virtually certain to be front and center during the discussions. Some of these questions are summarized below. What are the objectives you seek to accomplish through mediation and what are the underlying interests that would be furthered if these objectives were achieved? What is understood with respect to the objectives of the other party and what are the underlying interests of the other party that would be furthered if their objectives are achieved? What options exist for resolution of the dispute? This question should be considered with the recognition that it is unlikely that the matter will resolve if all of one party’s interests are met and none of the other party’s interests are met. Accordingly, consider options that would be acceptable to you and may be acceptable to the other party. Such options are not limited to the remedies that would be available through litigation—in mediation they are limited only by the creativity and desires of the parties. What is the best alternative available if the matter does not resolve through mediation, and what are the implications if that alternative is pursued in lieu of a negotiated agreement? What are the implications in terms of cost, time to resolution, market disruption, productivity, sales, etc., if the parties do not resolve the matter through mediation? Preparation for the mediation increases the likelihood of a satisfactory outcome. A satisfactory outcome may involve a settlement on negotiated terms or the recognition that some alternative course of action would be preferable to a settlement on terms available through the mediation. Having considered the above questions in advance of the mediation, the parties will be well positioned to have a constructive dialogue around possible bases for resolving the dispute through mediation. At the outset of the mediation hearing, mediators typically explain the mediation process to both parties. A representative of each party with authority to settle the matter should be present for mediation to be effective. The mediator will confirm that the persons in attendance have such authority if such has not been confirmed in advance of the hearing. In addition to a representative of each party with decisional authority, counsel for each party may attend to provide advice to their client during the course of the mediation. Following an explanation of the mediation process, a mediator may elect to engage in a joint session in which each party explains their position and their objectives. Not all mediators commence the mediation with a joint session. Some mediators are of the view that starting the mediation with a joint session only heightens tensions in an already stressful situation. Mediators of the view that an initial joint session may not be beneficial will proceed to private sessions in which they explore the interests of the respective parties and options for resolution of the matter proposed by the parties. The mediator typically engages in shuttle diplomacy between the parties, sharing information that each party has authorized the mediator to disclose to the other party. In private sessions, the parties typically are more willing to confide in the mediator with respect to underlying motivations for positions they may have and possible solutions, while understanding that the mediator will keep in confidence information that is not to be disclosed to the other party. If the parties arrive at a resolution in mediation, a memorandum summarizing the terms of their agreement is typically drafted. The memorandum may be reduced to a formal settlement agreement by counsel for the parties. Mediation is not the answer for every party involved in a patent dispute. Nevertheless, given the advantages afforded by an early settlement, it should always be considered. Part 1 of this series discussed the general nature of mediation as a dispute resolution process. There are a number of reasons why parties may find it advantageous to attempt to resolve a patent dispute through mediation rather than litigation. Some of those reasons are considered below. Uncertainty of litigation outcome – After more than 35 years in practice, I have come to understand that the only thing certain about the outcome of litigation is the uncertainty of the outcome. This is particularly true in the arena of patent litigation, which involves complex issues of law and fact. In the United States, most patent cases are tried to juries. The jurors, selected out of the general public, are rarely technically trained and, as a rule, are often ill-equipped to understand the highly technical subject matter involved in many of the cases. Even if a jury or judge understands the technology, it is often difficult to predict in any given case whether infringement will be found or the validity of asserted claims will be upheld, as the outcome frequently involves subjective determinations. Years until final judgment – It takes years to resolve a patent dispute in the courts. After a judgment from a federal district court, the losing party may file an appeal, which is likely to take another year or more. By the time a final judgment is rendered, the exigent circumstances that initially motivated the filing of the lawsuit may no longer exist. An accused party may modify their product following the filing of suit so as to avoid infringement and limit the possible damage recovery. An injunction precluding the ongoing sale of an accused product may be of less importance due to changes in the marketplace. For these reasons, a favorable judgment after years of costly litigation may represent only a pyrrhic victory. Litigation costs – Over 90% of patent lawsuits are settled before trial. Litigation costs for a patent case through a district court trial routinely exceed $1 million. For those companies that can afford the fight, litigation often presents a major distraction for the business. Many companies are unable to afford the costs associated with a prolonged and vigorously contested patent litigation. In contrast, mediation is a comparatively inexpensive process that typically lasts a day or involves a few sessions spaced over weeks or months. A mediation that results in a settlement of a patent dispute will avoid substantial litigation costs, including costs associated with discovery, motion practice, trial preparation, trial, and any ensuing appeals. Flexibility of settlement terms – The parties to a patent infringement action will usually either view the outcome as a win or a loss. A final judgment by a court offers no opportunity for the parties to fashion a creative resolution that may serve the interests of both parties. By contrast, in mediation, the parties determine the terms of settlement and any options may be considered—e.g., phase outs, cross-licenses, other license arrangements, manufacturing agreements, etc. Selection of Mediator(s) – Unlike litigation, in which an assigned judge presides over the case, parties to mediation may select the mediator. Judges often have little familiarity with technical matters and some judges have little experience with patent cases. On the other hand, selection of a mediator by the parties allows the parties to obtain the services of someone familiar with patent law or the specific technology. The selection of a mediator with specific knowledge related to the involved subject matter reduces time and effort educating the mediator with the legal and/or technical issues involved. Additionally, while many mediations involving patent disputes proceed before a single mediator, the parties may elect to engage two or more mediators should there be a good reason to do so—e.g., one mediator may have particular expertise in the facilitative mediation process, while another may be a technical or patent expert. While the mediator’s role is not to render a decision, should the parties desire that the mediator engage in an evaluation of the case, a mediator with expertise in the relevant field may be desired by the parties. Continuing Relationships – The filing of a lawsuit often does little to improve the relationship between the parties to the suit. There may be an ongoing relationship between two parties and/or a desire that the parties continue to work together once their differences are resolved. Mediation provides a process for parties to resolve their differences without the lingering animosity and distrust that often accompanies “civil” litigation. There is no loser in a settlement that is fashioned by and agreeable to both parties. Confidentiality of mediation – Although information disclosed to the other party in a patent litigation can be prevented from disclosure to the general public via a protective order, court proceedings are public proceedings. Mediations are not public proceedings. With only a few exceptions, mediators have an obligation to maintain in confidence information obtained from the parties. In most circumstances, mediators cannot be subpoenaed to testify or produce documentation or notes in a subsequent judicial or administrative proceeding. Additionally, parties to mediation can contractually agree that the parties will not disclose or use any information obtained during mediation for any purpose apart from the mediation. Prior efforts at settlement have been unsuccessful – If parties to a dispute would prefer to resolve a matter by settlement but have been unsuccessful in their unaided efforts, facilitative mediation may be of assistance to overcome obstacles the parties were unable to address on their own. It is often said that mediation provides an opportunity for parties to trade hope for certainty. It is this opportunity for certainty that can make mediation of a patent dispute particularly appealing. A settlement achieved through mediation may be viewed as a victory in its own right due to the avoidance of future costs, business distractions, and the uncertainly associated with a prolonged patent litigation. In our final segment (Part 3), we will conclude with some discussion on how parties arrive at mediation and discuss the mediation process. In recent years, mediation has been used with increasing frequency by parties to patent disputes for good reason. Mediation has the potential to achieve a rapid resolution of the matter upon terms mutually agreeable to the parties. Mediation is an extra-judicial process that has been described as an assisted negotiation. It is a voluntary process in which parties to a dispute seek to resolve their differences with the aid of a neutral, disinterested third party (a mediator), who facilitates discussions by attempting to focus discussions on the underlying interests of the parties. In the course of the mediation, the parties are encouraged to explore options of their own creation that address their respective interests. The mediator neither advocates on behalf of either party nor seeks to impose a resolution. Moreover, the mediator has no power to render a decision with respect to the matter. The parties are solely responsible for the terms of any settlement reached through mediation. Mediation and arbitration are sometimes confused; however, they are different forms of dispute resolution. In arbitration, a disinterested party (arbitrator) functions like a judge, and the arbitrator, not the parties, determines how the matter is to be resolved. Mediation is attractive because, if a resolution is reached, the parties avoid prolonged uncertainty of outcome. In a circumstance in which a party is willing to consider mediation of the dispute, a question arises as to when mediation should be pursued. If pursued shortly after the filing of a patent lawsuit, a party may be of the view that there has been insufficient discovery to evaluate the merits of the case. If delayed well into discovery, the parties will have incurred substantial litigation costs. When successful, mediation can produce a resolution in days or months, and at far less cost than a resolution through the courts. Although mediation has proven to be an effective process for resolving patent disputes, as mediation is a voluntary process, a settlement will be obtained only if the parties find common ground. If a patent owner initially demands that an accused infringer cease the manufacture and sale of an accused product, and the accused infringer refuses to accede to this demand, it would seem that resolution of the matter through mediation would be difficult to achieve. In practice, however, the initial demands are simply viewed as the starting positions, and efforts are made to determine if there is a basis for the parties to bridge what may initially appear as irreconcilable differences. In this series, we will seek to demystify the mediation process, while addressing some of the unique considerations involved in patent disputes. The next segment will consider reasons why parties to a patent dispute may prefer mediation as a dispute resolution alternative to litigation. In the final segment, we will consider how parties may arrive at mediation and generally discuss the mediation process. The United States Patent and Trademark Office can be a tricky area to navigate if you are not familiar with its proceedings. 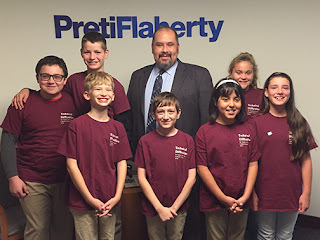 When a team of young inventors and their mentors approached us at Preti Flaherty to help begin the process for a patent application, we were excited to lend a hand. This unique pro bono case had me meet a team of students ranging from grades four to six. 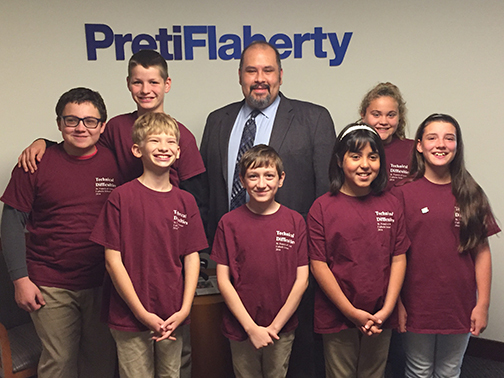 The team and their coaches took a road trip from New Hampshire to our Intellectual Property office in downtown Boston, where they presented their First Lego League project in front of me and my colleagues. If you are not familiar with First Lego League, it encourages elementary and middle school students around the world to research a real-world problem (ex. food safety, energy, or recycling), and challenges them to come up with a solution by encouraging them to design, build, and program a robot. Not any easy feat to accomplish between homework, family time, and play time. We are not at liberty to share the details of team The Technical Difficulties!’ inner workings, but I can say they have selflessly chosen to focus on a robot that will help the world of the blind and their faithful seeing-eye dogs. I have enjoyed the process of advising and guiding the team through the beginning of their patent filing journey by filing a Provisional Patent Application for the invention. Disclosure: a provisional patent application allows you to file without a formal patent claim, oath or declaration, or any information disclosure statement. After filing the Provisional Patent Application, the team took another trip to Boston so that we could discuss how best to continue their journey. All of us here at Preti Flaherty look forward to seeing where their IP journey takes them from here. Several types of patent searches are known for identifying patents and published patent applications of potential interest. One type of search, often called a novelty search, is employed to identify prior issued patents and published patent applications relating to a particular concept or idea in an effort to assess patentability of the concept. Another type of search, often known as an infringement or freedom to operate search, is conducted in an effort to identify patents the claims of which may present infringement questions with respect to an intended product. Patents and published applications are sometimes overlooked as a general technology resource for purposes of product development and market research. The quest for such patents and published applications, sometimes known as a state-of-the-art search, serves the purpose of gaining a general knowledge of the patent landscape in respect to a particular area or field of technology rather than just a specific concept. Such a search can be conducted for the subject matter of interest and also for names of known inventors and owners of relevant technology. Some patents often contain a background section that traces the patent history of prior related technology, which can reveal additional information of potential relevance. Patents and published applications are readily accessible via the website of the United States Patent and Trademark Office (USPTO) and via the websites of other countries or jurisdictions, such as the European Patent Office (EPO). Patent information is also available via commercial sites, such as Google Patents. Information collected from such patent investigations can prove to be of value in determining a product and market development path, whether a product concept is distinguishable from what is known and possibly patentable, and what the competitive picture may be. Such investigations may also illuminate the need for more specific patent searching to assess risks of infringement of a particular product implementation. The scope of this type of patent investigation can vary to suit particular purposes and budget. For example, the investigation may be limited in geographic scope to cover only the United States or other countries of interest, and may vary in technological scope to suit specific circumstances. The investigation may also be conducted in stages depending on results from a prior stage, and may extend to non-patent information such as can be obtained on the web and other sources. It is therefore useful to remember that product development and market research projects can often benefit from the information and knowledge gained by the identification and review of relevant data. Your Business May Be Infringing on a Patent. What Should You Do? What should your company do if it becomes aware of a patent having claims that appear to be relevant to one of its products or receives a cease and desist letter charging infringement? When a suit for patent infringement is filed, in the event of an adverse judgment, an infringer may be subject to permanent injunction that precludes further infringement and an order to pay the patent owner money damages to compensate for the infringement. In certain circumstances, the courts have the discretion to increase the amount of the damage award. Under the patent laws “the court may increase the damages up to three times the amount found or assessed.” The damages are enhanced in circumstances where the infringement is said to be “willful.” Additionally, “[t]he court in exceptional cases may award reasonable attorney’s fees to the prevailing party.” A finding that the infringement is willful and that the case is exceptional often go hand in hand. These provisions pose substantial risks in the event a court finds that the accused party infringes the asserted patent(s) and that the infringement was willful or that the case was exceptional since the multiplication of the damages and the patent owner’s attorney fees can involve large sums. A historical perspective is useful in understanding how the courts have dealt with claims that an infringement was willful. The Underwater Devices Court stated that where a defendant, in good faith, relied on a competent opinion of counsel that concluded there was no infringement or that the relevant patent claims were invalid, the opinion would serve as a defense to a charge of willful infringement. Thus, as of the 1983 timeframe, in response to a cease and desist letter charging infringement, the accused infringer was well advised to obtain an opinion of counsel that concluded that there was no infringement or that the asserted claims were invalid if counsel could provide such an opinion. To satisfy the requirement that the opinion be viewed as a “competent opinion of counsel” such opinions usually would involve a thorough analysis of the claims, the patent specification, the Patent Office file history and any relevant prior art. Competent opinions of counsel routinely served as a defense to charges that an infringement was willful and that a case was exceptional so as to justify increased damages and an award of attorney fees. The CAFC revisited the law of willful infringement in 2007 in In re Seagate Technology, LLC. In the Seagate case, the Court held that “to establish willful infringement, a patentee must show by clear and convincing evidence that the infringer acted despite an objectively high likelihood that its actions constituted infringement of a valid patent.” The Seagate Court thus equated “willfulness” to reckless behavior; i.e. a reckless disregard to the patent owner’s rights, and expressly abandoned the duty of due care requirement along with the associated affirmative obligation to obtain an opinion of counsel enunciated in the Underwater Devices case. As a consequence of the Seagate decision, it became more difficult for patent owners to obtain enhanced damage awards and parties charged with infringement were more reluctant to seek opinions of counsel and incur the costs associated therewith. Instead, when charged with infringement, parties often asserted that their conduct was not objectively reckless based on internally generated theories or theories developed during the litigation. With the Seagate decision, the pendulum had swung in favor of parties accused of infringement and enhanced damage awards were more difficult to obtain. In 2016, the Supreme Court, in Halo Electronics, Inc. v. Pulse Electronics, Inc., considered the requirements for a finding of willful infringement. As a result of this decision, the pendulum once again swung in favor of the patent owner. The Halo Court stated that the Seagate test reflected “a sound recognition that enhanced damages are generally appropriate ... only in egregious cases” but that the Seagate test was unduly rigid and “impermissibly encumbers” the discretion granted to the district courts. The Supreme Court in Halo equated willfulness with egregious conduct without setting forth a more explicit standard and explained that “[a] patent infringer's subjective willfulness, whether intentional or knowing, may warrant enhanced damages, without regard to whether his infringement was objectively reckless.” The Halo Court also rejected the requirement that willfulness be proved by clear and convincing evidence as had been the standard of proof applied for decades and held that “the statute at issue supplied no basis for imposing a heightened standard.” Thus, post Halo, patent owners may satisfy their burden of proof for a finding of willful infringement by showing egregious behavior by the infringer with proof by a preponderance of the evidence rather than by the heightened clear and convincing evidence standard. Left open for interpretation was what actually constitutes egregious behavior. Given this context, following the Halo decision, opinions of counsel appear once again to take on greater importance as is it less likely that an accused infringer, having sought and obtained a competent opinion of counsel as to non-infringement or invalidity, would be found to have engaged in egregious behavior so as to justify enhanced damages. As a result of the Halo decision, in response to receipt of an assertion that a product infringes another’s patent rights, or upon recognition that the claims of an issued patent could potentially be relevant to a company’s business, the matter be referred to patent counsel to assess the patent claims with respect to their applicability and/or validity. Patent counsel may then consider whether, given the circumstances, an opinion of counsel can or should be provided. The costs associated with the preparation of such an opinion are typically far less than the additional amount payable to a patent owner should enhanced damages or attorney fees be awarded following an adverse judgment. It is generally known that one who manufactures, uses, sells or offers to sell a product in the US or that practices a process in the US that is covered by one or more claims of a US patent is liable for patent infringement under US law. Less well known is that certain activities involving activities outside of the US can give rise to a cause of action for patent infringement. Under US law one who imports into the US or offers to sell, sells or uses within the US, a product made by a process patented in the US is liable for patent infringement even if the process is practiced outside of the US. 35 U.S.C. 271 (g). Thus, one cannot avoid claims to a patented process simply by making a product in accordance with the patented process overseas. A recent court case considered the authority of the US International Trade Commission (USITC) to issue exclusion orders barring importation of goods where the subject goods did not infringe as of the time of importation but were used by the importer to directly infringe a US patent at the inducement of the foreign supplier of the goods. Section 337 of the Tariff Act of 1930 authorizes the USITC to investigate allegations of unfair trade acts in the importation of articles that infringe a valid United States patent. 19 U.S.C. § 1337(b)(1). The Court of Appeals for the Federal Circuit (CAFC) recently held that the USITC has the authority under Section 337 of the Tariff Act to issue an exclusion order blocking the importation of products that do not directly infringe at the time of importation into the US where the foreign seller was inducing a direct infringement by the importer. The Court held that this position was reasonable because it was consistent with the mandate of the USITC to “safeguard United States commercial interests at the border” even absent a direct infringement at the border. Suprema, Inc. et al. v. International Trade Commission et al., 2012-1170 at 26-27 (Fed. Cir. August 10, 2015). Under US law Whoever without authority supplies or causes to be supplied in or from the United States all or a substantial portion of the components of a patented invention, where such components are uncombined in whole or in part, in such manner as to actively induce the combination of such components outside of the United States in a manner that would infringe the patent if such combination occurred within the United States, shall be liable as an infringer. 35 USC 271 (f) (1). Assume a US manufacturer within the US exports one or more components of an invention that is the subject of a US patent. If the US manufacturer instructs the customer to combine the one or more components so as to produce a product that would infringe the US patent if the product were made in the US, the US manufacturer is liable for infringement even though the patented invention was never made in the US. Under US law, Whoever without authority supplies or causes to be supplied in or from the United States any component of a patented invention that is especially made or especially adapted for use in the invention and not a staple article or commodity of commerce suitable for substantial noninfringing use, where such component is uncombined in whole or in part, knowing that such component is so made or adapted and intending that such component will be combined outside of the United States in a manner that would infringe the patent if such combination occurred within the United States, shall be liable as an infringer. 35 271 (f) (2). Under this statute, a party can be liable for contributory infringement if the party is exporting a non-staple article of commerce that is intended for use in a product covered by a US patent even if the component, per se, is not covered by any claims of a US patent. The party exporting the unpatented component will be liable if the unpatented component is specifically adapted for use in a product covered by a US patent. Contributory infringement may be found even if the combination of the unpatented component with other components to form the patented invention occurs outside of the United States. An offer to sell a product that would infringe a US patent constitutes an act of patent infringement under US law. In a recent decision, the Court of Appeals for the Federal Circuit held that, for purposes of infringement, an actionable offer to sell occurs when a company makes an offer outside of the US to sell a product that will ultimately be used in or delivered to the US. The act of offering the product covered by one or more claims of a US patent which was planned to be delivered to the United States was held to constitute the infringing act. As noted above, there are exceptions to the general rule that the reach of a US patent ends at the US border. It is therefore important to be aware that certain acts that occur in foreign countries can be actionable under US patent law. Additionally, certain acts in the US that do not amount to a direct infringement can still be actionable if coupled with overseas activity that would constitute an infringement of a US patent if the activity occurred in the US. When questions arise regarding the applicability of US patents to foreign activities it is generally advisable to consult a specialist that deals with such matters. Blog authored by Vic Lebovici, a member of Preti Flaherty's IP Practice Group. Preti Flaherty's intellectual property lawyers discuss developments and trends in the areas of patents, trademarks, copyrights, licensing and intellectual property litigation. The group, whose practice is international in scope, represents clients in more than fifty countries.